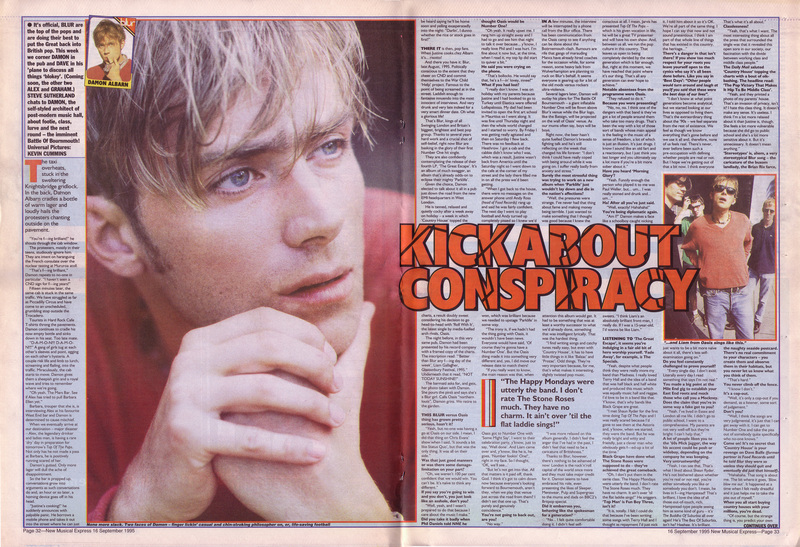 Steve Sutherland interviews Damon Albarn, 16th September 1995. Photos by Kevin Cummins. Seeing as I have the N.M.E. pile out and we’re all still flushed from seeing Blur on stage again at Glastonbury 2009 I thought I’d post this, the counterpart to this cover, which has proved extremely popular. Gasp again to the cut and thrust of Blur vs. Oasis; thrill to the shenanigans of Cuntry House and The Great Escape; or just simply drool over the lovely Cummins picture of the young Albarn. The years are starting to show though aren’t they? Quite understandable for Albarn to change the lyrics in End of a Century from “the mind gets dirty, as you get closer to thirty” to fifty, given the circumstances. It doesn’t scan as well but I’ll forgive him. So I dunno if I was naive, but I wasn’t expecting quite such a retreat to the ‘Britpop’ Blur – perhaps Damon & Co. needed to be reminded of what great work they’ve produced over the years to feel re-invigorated for the future? It has, lest we forget, been a long slog for them over the last 20 years. 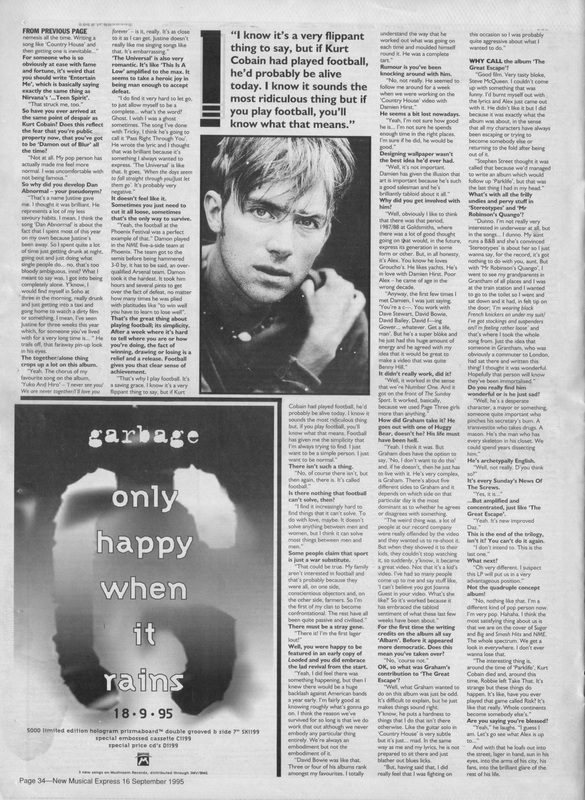 Something I was reminded of again today thanks to the serendipitous joys of Twitter when I read Rhodri Marsden’s first hand recollection of meeting Blur in their orignal Seymour form and then subsequently touring with them. 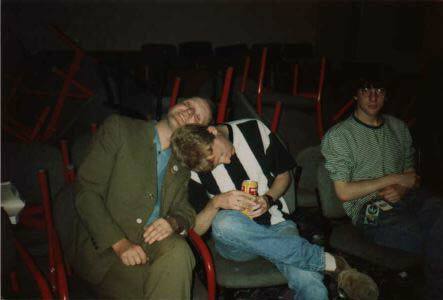 Well worth reading and there’s this photo that shows why Dave gave up drinking. It just so happens that I’ve managed to scan in a review from one of these early Blur performances where The Keatons supported. If you missed it the first time it’s here. And let’s not forgot all of Blur’s festival unfriendly tunes. Here’s a Spotify playlist showcasing the gloomy side of Blur through the years. Filed in Advertisements, Interviews, N.M.E. This magazine came out on Justine’s birthday!! Thanks for posting this, it’s very interesting, I learnt a lot about The Great Escape, for instance I didn’t know what The Universal was about!! I don’t get why people around that time treated Damon like a brainless man just because he was good-looking. He seems super clever and I think he is pure genious!! All images scanned at 100% 150dpi. 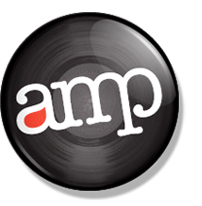 Type in the name of the band, journalist, photographer, year etc. to see all pertaining content. It's ugly but it works.